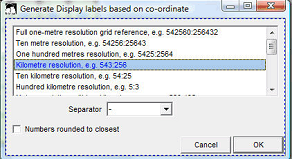 The new Unique Parcel Numbering (UPN) system – and also other features – depends on the geographical grid of UTM with a grid distance of 1 km. The design of a grid (based on UTM 30) is therefore very useful. See also Chapter 7.8.1 on UPN and the importance of the UTM-grid on Local Plan follow-up. Select folder > Define new file name > Save. 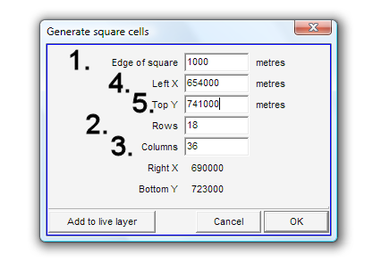 In the example below, a grid cell layer has been created with a matrix of 10 x 10, each cell 1000 m wide and high, by default numbered with an A1-based code. You have now created the coordinates in the label: The first three digits are the x (Easting) value, the last three digits are the y (Northing) of each cell. 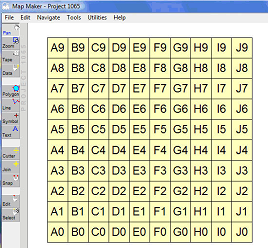 In a similar way, you can create a grid for War Office projection (see Annex 8). 1. You first generate a grid as explained above, disregarding the projection you are in. See also Chapter 5.2.2 for conversion. 3. 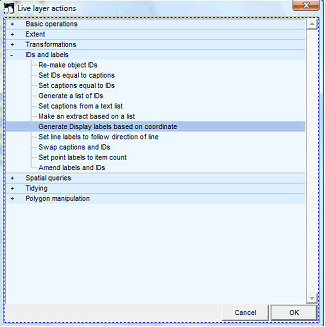 You can now display or process it in your standard LUPMIS configuration like any other layer. 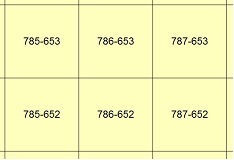 See references to grids (flight index maps of pilot communities) through Annex 9.